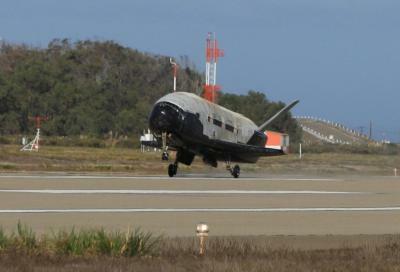 VANDENBERG AFB, Calif. --- The Boeing built X-37B Orbital Test Vehicle (OTV) successfully de-orbited and landed today at Vandenberg Air Force Base at 9:24 a.m. PDT, concluding a 674-day experimental test mission for the U.S. Air Force Rapid Capabilities Office. The X-37B was launched from Cape Canaveral Air Force Station, Fla., on Dec. 11, 2012. A unit of The Boeing Company, Boeing Defense, Space & Security is one of the world's largest defense, space and security businesses specializing in innovative and capabilities-driven customer solutions, and the world's largest and most versatile manufacturer of military aircraft. Headquartered in St. Louis, Boeing Defense, Space & Security is a $32 billion business with 56,000 employees worldwide.